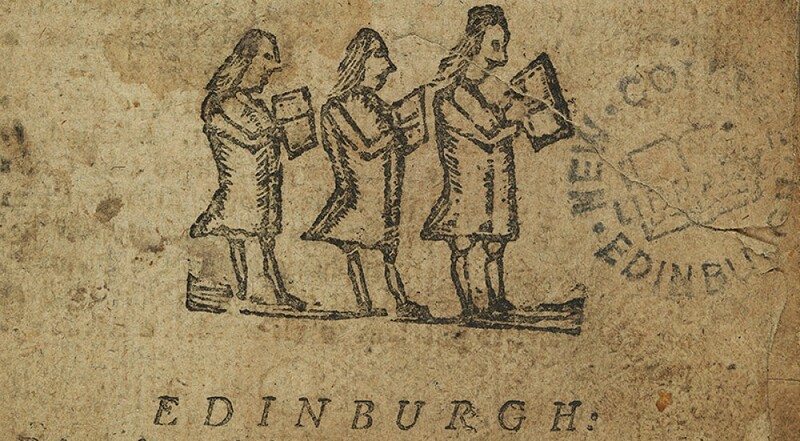 We’re delighted that the cataloguing of nearly 500 items held in the Shaw Collection on the Catholic Apostolic Church at New College Library, is now complete. 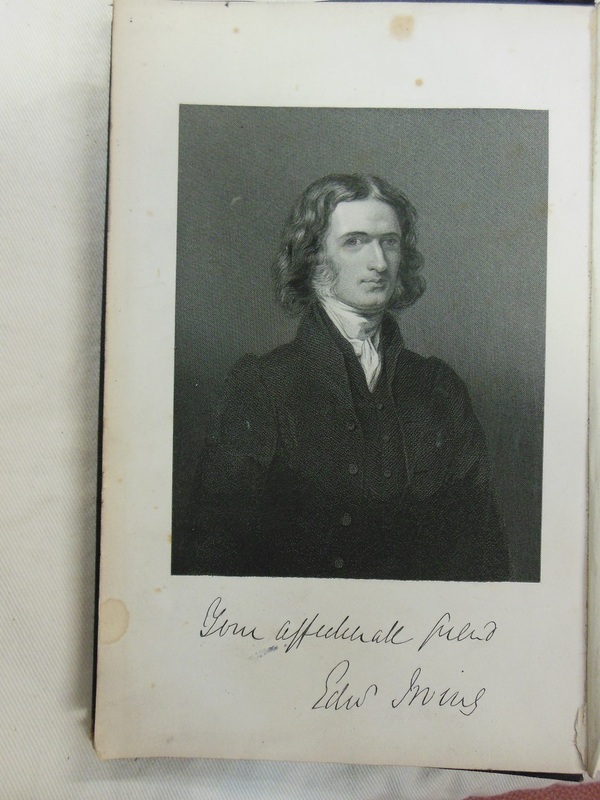 While further research is required to verify the history of this collection, it may have been put together by P.E. Shaw, author of The Catholic Apostolic Church, sometimes called Irvingite (A Historical Study); New York, 1946. The Catholic Apostolic Church movement was inspired by Edward Irving, who began his career as a Church of Scotland minister who worked with Thomas Chalmers on his urban ministry projects. Irving moved to London where he became a strikingly popular preacher, predicting that the world was irredeemably evil and that the return of Christ and the end of the world was at hand. His charismatic services included controversial spiritual phenomena such as speaking in tongues. The collection covers the liturgy, doctrines and government of the Catholic Apostolic Church movement, along with sermons and addresses by prominent figures in the church. 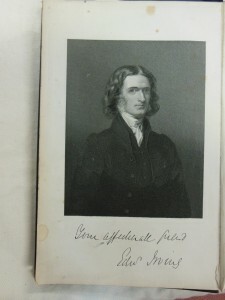 This includes items written by eight of the ‘twelve apostles’ who were appointed after Irving’s death in 1835 – Henry Drummond, John Bate Cardale, Nicholas Armstrong, Francis Valentine Woodhouse, Henry Dalton, Thomas Carlyle, Francis Sitwell and William Dow. The Catholic Apostolic Church believed in the imminent second coming of Christ, and the necessity of the restoration of a ‘perfect’ church in preparation for this event. Missionary activity took the movement to mainland Europe, Canada, and the USA, and the Church claimed 6,000 members in 30 congregations in 1851. In the twentieth century the movement dwindled and eventually fell silent. 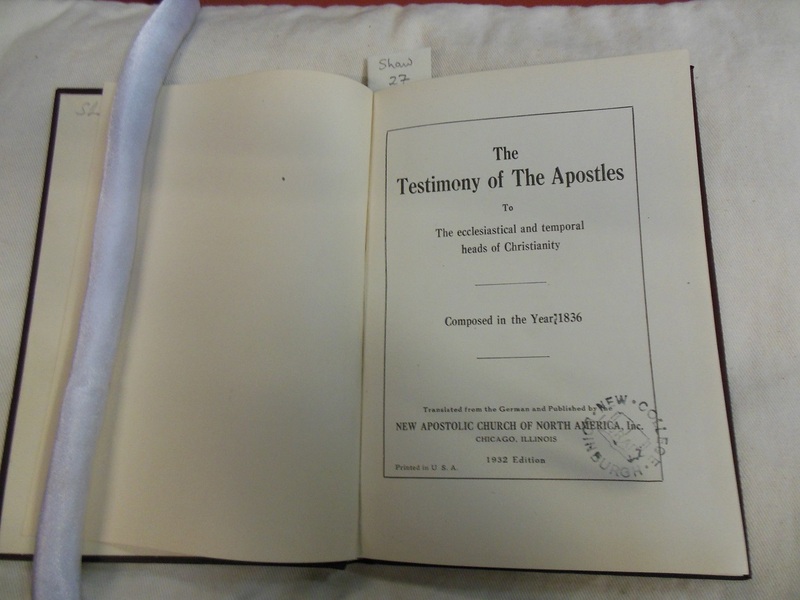 The testimony of the Apostles to the ecclesiastical and temporal heads of Christianity : composed in the year 1836. Chicago, Ill. : New Apostolic Church of North America, 1932. New College Library Special Collections SHAW 27. 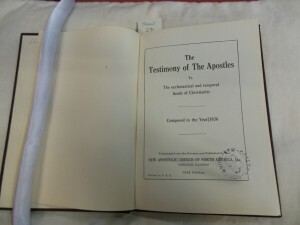 The cataloguing of this collection was made possible by the generous donation of Rev. Dr. Robert Funk. Christine Love-Rodgers, Academic Support Librarian, Divinity, with thanks to Janice Gailani, Funk Projects Cataloguer. This entry was posted in Library and tagged Divinity, Funk, new college library, nineteenth-century, Special Collections by cloverodgers. Bookmark the permalink.